7:20 - My alarm goes off. I press snooze. 8:25 - I arrive at school, where I should be by 8:30 every morning. I take off my shoes and put on my slippers. The lights are on in my office, so my co-teacher YH must already be here somewhere. A few minutes later he walks in and tells me we now have a color printer next door that we can use for English! Hooray! I guess there was money in the budget this year. He adds the printer to my computer, but says our black and white printer (that sits between our desks) still won't let me connect to it. (I've been unable to print for the past two weeks. He's been saying he'll have someone look into it... meanwhile I just message him documents whenever I need to print something). 8:55 - Monday is the only day of the week that we don't have an English class during first period (at 9:00). Rather, we teach our fourth class after lunch during fifth period. So I work on my 1st grade (after school daycare) lesson plan for next week and make sure I'm ready for the afternoon's 1st and 2nd grade daycare classes. Then I look at the day's sixth grade lesson, which we'll teach to four classes. 9:40 - I go to the English room. My other co-teacher YJ is in there working at the computer in front. She tells me that she can't talk much today because she has the flu. She sounds miserable. I write the day's objectives and activities on the chalkboard. 9:50 - Second period should start now but there are no students here. YJ is currently out of the room. 9:51 - My co-teacher YJ comes into the classroom. "Where are they?" she asks aloud. 9:53 - YJ calls the students' classroom, talks for a few seconds, then sighs. She leaves the room. I'm assuming that the class's homeroom teacher forgot they were supposed to come down to the English room for class. That's because we couldn't use the English room for the first two and a half weeks of the school year (The new school year just began at the start of March. Korean academic years run from March to February). Construction was going on in a second grade classroom, so the second graders used the English room as their classroom and we went to each class's homeroom for English class. We got our English room back last Wednesday, but today was the sixth graders' first time being in the English room this year. 9:55 - My co-teacher returns to the classroom, with our sixth grade class behind her. 10:30 - Bell rings (Fur Elise plays) but we do a review for two more minutes to check the day's objectives. Then we dismiss the class. 10:34 - Two sixth grade girls come up to me in front and point to the new signs underneath the windows that I made in February. They have me read each one aloud. (Ah, I'm secretly thrilled that someone noticed!) They don't understand what each one means, but I was so happy that they'd asked and listened to me read each one, trying to understand. 10:40 - Third period begins, our second class of the day. Our next class starts at 11:30. 12:00 - There are ten minutes left of class and a girl raises her hand and says something in Korean to my co-teacher. Pause. Then ten kids get up and leave class. My co-teacher tells me they have lunch duty. 12:07 - My co-teacher ends class early because this class of sixth graders needs to be at lunch first today (and they still have to go back upstairs to drop off their books, and then down to the first floor for lunch). We usually end class after the bell with this co-teacher, so it's nice to be done a few minute early, especially before lunch. Eating lunch is something I look forward to every day. It's always delicious and filling. I'd like to point out that I've been eating Korean school lunches for nearly six straight months, yet two of today's sides and fruit we hadn't had before at school. There's so much variety! 12:25 - It's happened once before during the last school year, but this is the first day this school year that I'm left eating alone at lunch. 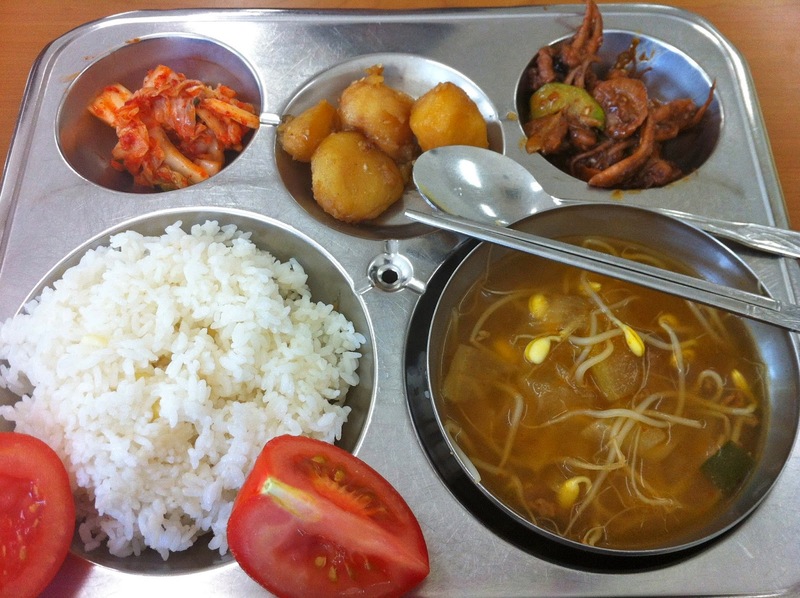 Korean teachers eat so fast! Most of them left our teacher table and it was just myself and my co-teacher YH left. He was waiting for me, so I told him it was okay to leave - he didn't need to wait. So he left. I feel much more relaxed eating at my own pace without pressure to speed up and finish because everyone's waiting for you to finish. But most days I must pace myself to keep up and not be lagging behind. 13:00 - Fifth period should start now. My co-teacher calls the class because they're not here yet. 13:02 - Class is here, we begin. 13:40 - Class ends. Tomorrow I have sixth grade again with the same co-teacher, so right now she quickly tells me which book activities she wants us to cover tomorrow. And then she goes to the nurse's office because she has a headache (plus the flu!). I go back to my office and work on daycare lesson plans. 14:08 - My other co-teacher YH turns off the heater in our office. The building is still really cold in the mornings, but has since warmed up now that it's the afternoon (and the heater has been on all day). 14:27 - I go into the English room to set up for my first daycare class of the afternoon: second grade. 14:50 - Our class is supposed to start now, but the kids don't show up until 2:55. They trickle in, with more kids coming after we're a few minutes in. After our start of class routine (Hello Song, Monday Song, how are you?, how's the weather?) we reviewed colors with this fun color song. I gave everyone little pieces of colored paper that they had to hold up when that color was sung. They really liked that the song got faster at the end. There were many "One more time! "s, so we listened to the song a couple of times. And then we started learning shapes with a new song and guessing game. Julie (one of the few that go by an English name) must have put it in there. 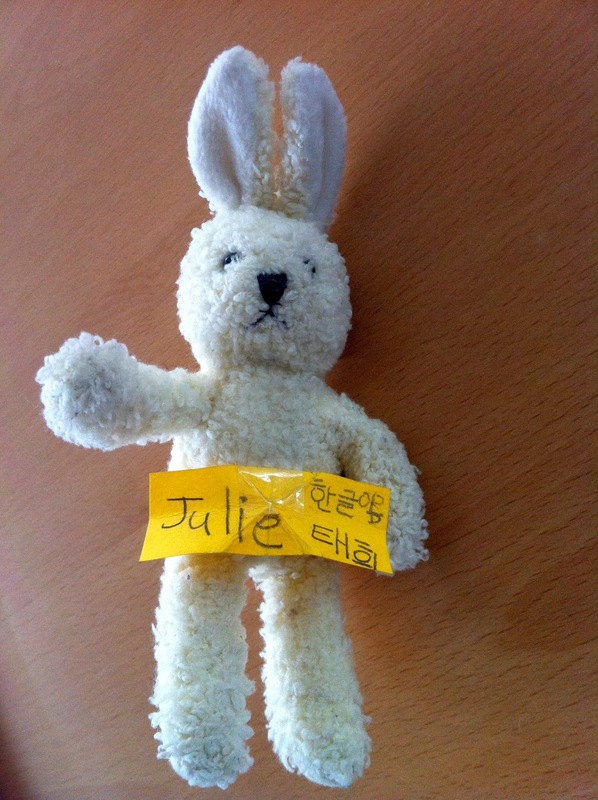 Wait, did a second grader just gift me their stuffed animal rabbit? No time to even translate what she'd written on the note, as I start setting up for my first grade class that I have next. From my lesson plan in Google Drive I open all of the links to the different songs in Youtube that I'll use during the class, then look over my plan. 15:40 - No kids yet, they'll be here soon. 15:41 - The phone rings in the English room. Normally I never answer the phone, whether it's in our office or the English room, but since I'm the only one who would be in the English room right now (and so the person calling must be trying to reach me), I hesitantly pick it up and say "Hello?". Pause. They say some stuff in Korean, and then "Rebecca"? "Nay, yes." They say a bunch more stuff in Korean to me. Intonation tells me that they've asked me a question. Uhhh "I don't know." I offer, slowly. "I don't know" the person on the other line repeats. At this point I don't even know who I'm talking with! They say some more stuff in Korean, and then the English words "My class". Is it the first grade teacher wondering where class is today? "Yogi, here, in English room" I say. She says some more stuff in Korean and then hangs up. Uhh okay. I wait for them to come. 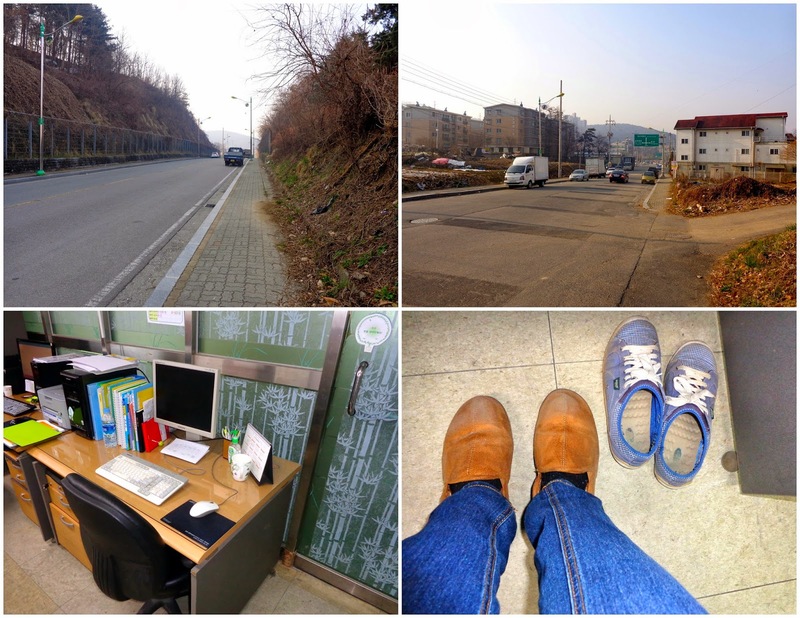 15:42 - A third grade (head) teacher comes into the English room and says some stuff to me in Korean. She makes the phone symbol, so I take it whoever just tried calling me had called her. Something about the first grade class. I point to myself and then down, as in downstairs. Yes, that's it. I'm supposed to go down to their room I believe. Ugg, I sigh. Everything was set up here! Why, oh why! 15:44 - I get down to the first grade daycare class in the other wing of the school and set my basket of stuff by the computer. This teacher's computer only has Internet Explorer (groan), so I log into my Google Drive (2-step verification) to get my lesson plan with all of the links I need. It does not work well in IE. So once I get the Hello Song open I get them started without setting up anything else. 16:21 - I end class around the normal time, even though we started a bit late. Some kids got picked up by their parents throughout, and more parents come around this time. 16:24 - I go back up to the English classroom and clean up from before, shut down the computer, make sure windows are closed, lights off, and I lock the door. Our school has a huge problem with running in the halls. All the kids run everywhere constantly, even though it's not allowed. Since the start of the new year we now have hall monitors during the passing time. Sixth graders come down to our floor (of first and third graders) to watch for running. So I guess there will be a new system now with green and yellow cards. Good walking gets you a green card and running/bad behavior in the halls gets you a yellow card. He had trouble getting them to stay, so a container fell down twice, spilling the cards all over the floor. I helped pick them up twice. And then he stopped working -- it was past 4:30, time to go! 16:35 - I pack up, shut down, and leave school. I stop at the nearby post office to mail some letters, then pick up some bananas from the grocery store on my way home. Once home a little after 5 I put some much needed laundry in the washer, which I later hung up on my rack to dry. I washed my dishes, did a little bit of French practice on Duolingo, and then I've mostly just been blogging the rest of the night! 1.What has been your most surreal experience in Korea so far? Prior to this past weekend, I would have said simply living and teaching here has been surreal in itself. 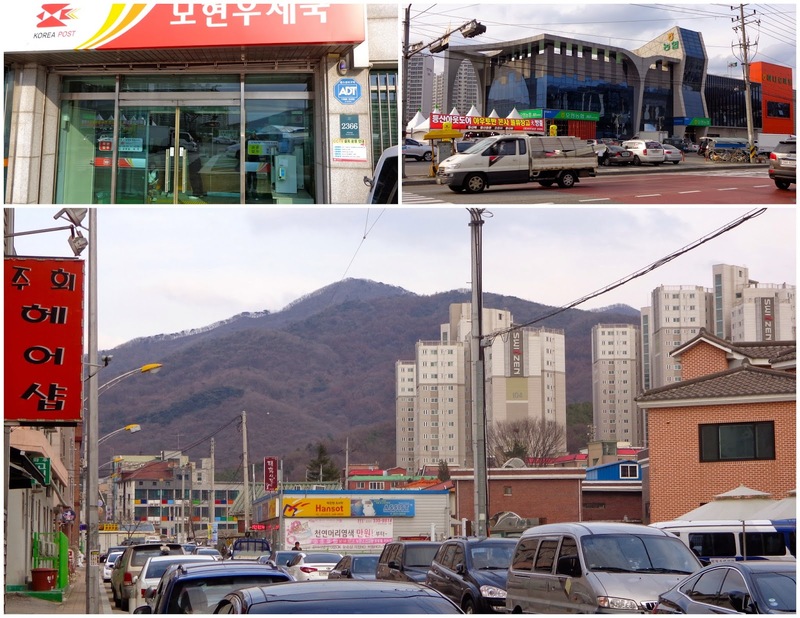 Calling this small town in rural Korea my home when two years ago I couldn't have pointed out where Seoul was on a Korean map, let alone pictured myself living here. I don't have a teaching license or education degree, and even though I previously taught English in Spain, it's much more "real" here. I'm a part of the school, it's a full-time job, and for my daycare classes I'm creating the curriculum by myself. So it's surreal that I'm actually someone's elementary school teacher. But after a trip to the DMZ this past Sunday - er, yesterday - I now have some specific moments that were quite surreal: Going underground to see the third infiltration tunnel that North Korea dug underneath the DMZ into South Korea, and looking at a North Korean Village and mountains through binoculars across the DMZ. 2. What would you have told yourself before you got on the plane in Chicago, given what you know now? Take your jacket with you, don't leave it on your seat in the plane! Hah yup, I did that. Before packing I would have told myself that ladies showing shoulders in Korea is the equivalent of wearing a mini-skirt in the USA. I didn't realize that, so I have a bunch of tank tops that I can only wear under things. Let's see, knowing what I know now, I would have told myself not to expect much praise - that no feedback isn't necessarily a bad thing. I had a heavy workload last school year and spent a lot of time lesson planning outside of school too. I didn't get much feedback and also spent a lot of time worrying or stressing about how I was doing. 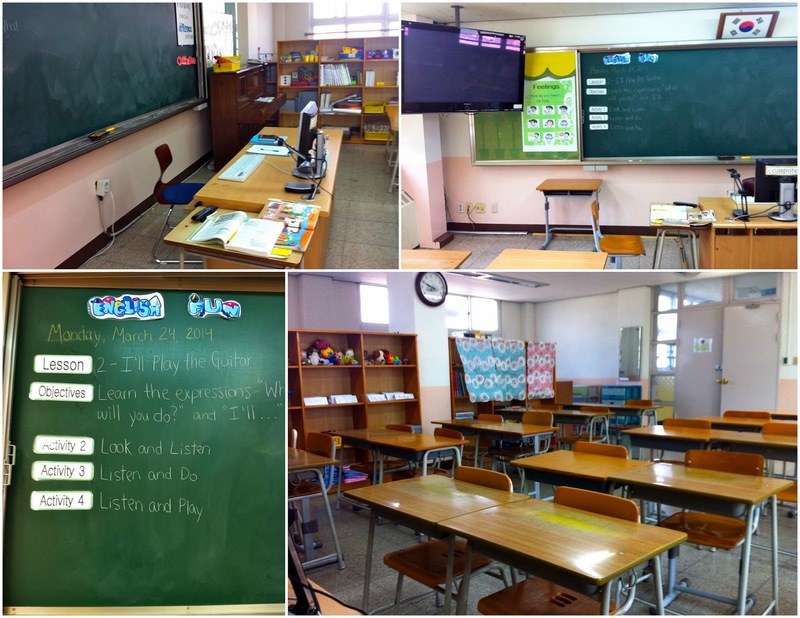 Turns out, Korean teachers are really busy and they simply don't praise as much in Korean society as they do in the states. So I would have told myself not to worry so much, that my best is good enough, and that no feedback can be a good thing! And remember, comment if you have a question you'd like us to answer later in the week! Thanks for reading! This is really cool! Glad to see glimpses into your every day life. Thanks for taking the time to do this. I'm so glad! Thanks, Bola! Thats pretty awesome that you are sharing this! I work at a hotel in Ohio, and one of the girls who was a housekeeper is teaching English in South Korea. We just got an email from her this past week! Thanks Miranda! Oh, that's great -- I hope she's enjoying her time so far!